1. G7 rattle markets: Global stocks have dipped ahead of a G7 summit in Canada that promises awkwardness -- and maybe even confrontation. Diplomatic tensions and an escalating trade war mean that President Donald Trump can expect a chilly reception at the summit, which some have dubbed the G6+1. "With new US tariffs now lodged against all but one of the remaining six members and Trump tweeting his still combative mood overnight, some leaders might be wondering if there might be more productive ways to spend their time this weekend," said Ken Odeluga, an analyst at City Index. Investors were looking for safe havens on Friday. The Swiss franc was trading higher against the dollar and gold also posted gains. 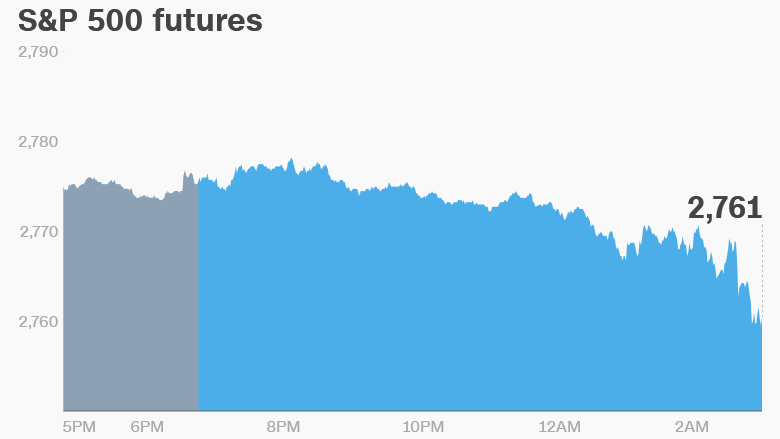 US stock futures were pointing down. European and Asian markets were also lower. The Dow Jones industrial average closed 0.4% higher on Thursday. The S&P 500 dropped 0.1% and the Nasdaq shed 0.7%. 2. What's next for ZTE? Questions continue to swirl following a deal between the United States and Chinese tech company ZTE. The Trump administration had banned the state-controlled smartphone maker from buying US parts. ZTE (ZTCOF) agreed to pay $1 billion and change its corporate leadership to have the ban lifted. ZTE also agreed to an US-appointed oversight team keeping tabs on the company from the inside. That arrangement took experts by surprise, and some questioned how it could work. 3. BT boss is out: UK media group BT (BT) has announced that CEO Gavin Patterson will step down later this year following weak earnings and shareholder skepticism over restructuring plans. Patterson, who has led BT since 2013, announced plans last month to cut 13,000 jobs as part of a restructuring designed to simplify the group's management structure. He also said the company would quit its 10-story headquarters in central London. 4. IMF bails out Argentina: The International Monetary Fund has agreed to grant Argentina a $50 billion line of credit to help the country out of a deep financial crisis. 5. Economics: The Bank of England has released a quarterly inflation expectation survey that shows Brits expect inflation over the coming year to be 2.9%. Canadian unemployment data for May will be released at 8 a.m. ET. The Baker Hughes US oil rig count report will be published at 1 p.m. ET.